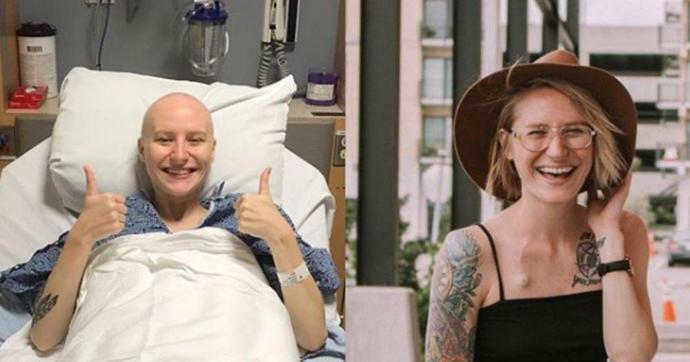 Cheyann Shaw first made headlines a few years ago when she posted a before-and-after photo depicting the toll cancer had taken on her body. The "before" photo showed the former bodybuilder competing on stage. The "after" was a photo of Shaw fighting for her life after undergoing a full hysterectomy and a five-and-a-half hour procedure that removed her spleen, her appendix, and part of her colon. Fast-forward to today and Shaw is cancer-free. The influencer took to Instagram to share how far she's come and how proud she is of her year-plus long journey. "I was only 97 pounds and still fighting for my life," she wrote of her "before" photo on the left. "When I was diagnosed with cancer I lost over 33 pounds within weeks because of the chemo and the cancer itself. I had lost all my weight and muscles that I worked so hard for and within a blink of an eye, I hardly recognized myself in the mirror. I had to learn to love myself even when I had a hard time looking at myself." The photo on the right was taken recently, she wrote. "Honestly, I cried like a big baby when I saw these pictures next to each other. So much has changed since the picture on the left and I'm forever thankful and grateful. In 1 year and 4 months I have gained 15 pounds back, celebrated 1 year of no evidence of disease, and I have never felt happier or more confident in my life. I've learned that through my battle with cancer, that no matter what life throws at you, there will always be a light in the darkness." Through the process, Shaw says she's developed a special appreciation for her body and everything that it's been through. "Within a year my body has gone through a billion rounds of chemo, 5 surgeries, and massive changes; but each day my body fights and wins this battle," she wrote on Instagram. "I love my body MORE NOW even without the muscles and with scars because to me, my body is beautiful and so is the story my scars tell. I've learned to ALWAYS love myself no matter what and so should you."